An insightful guide to understanding and visualizing multivariate statistics using SAS(R), STATA(R), and SPSS(R) Multivariate Analysis for the Biobehavioral and Social Sciences: A Graphical Approach outlines the essential multivariate methods for understanding data in the social and biobehavioral sciences. Using real-world data and the latest software applications, the book addresses the topic in a comprehensible and hands-on manner, making complex mathematical concepts accessible to readers. The authors promote the importance of clear, well-designed graphics in the scientific process, with visual representations accompanying the presented classical multivariate statistical methods . The book begins with a preparatory review of univariate statistical methods recast in matrix notation, followed by an accessible introduction to matrix algebra. Subsequent chapters explore fundamental multivariate methods and related key concepts, including: * Factor analysis and related methods * Multivariate graphics * Canonical correlation * Hotelling's T-squared * Multivariate analysis of variance (MANOVA) * Multiple regression and the general linear model (GLM) Each topic is introduced with a research-publication case study that demonstrates its real-world value. Next, the question "how do you do that?" is addressed with a complete, yet simplified, demonstration of the mathematics and concepts of the method. Finally, the authors show how the analysis of the data is performed using Stata(R), SAS(R), and SPSS(R). The discussed approaches are also applicable to a wide variety of modern extensions of multivariate methods as well as modern univariate regression methods. Chapters conclude with conceptual questions about the meaning of each method; computational questions that test the reader's ability to carry out the procedures on simple datasets; and data analysis questions for the use of the discussed software packages. 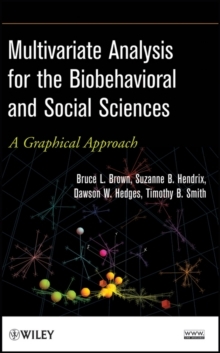 Multivariate Analysis for the Biobehavioral and Social Sciences is an excellent book for behavioral, health, and social science courses on multivariate statistics at the graduate level. The book also serves as a valuable reference for professionals and researchers in the social, behavioral, and health sciences who would like to learn more about multivariate analysis and its relevant applications.